How can we inspire more students to study Italian? This will be the leading question of our seminar, bringing together university lecturers and school teachers to share resources, teaching tips and funding opportunities for promoting the study of Italian from GCSE to higher education. We will cover the career opportunities and the added value of studying a more niche language, as well as the historical and contemporary connections between Italy and the UK. Whether you, or someone you know is considering studying Italian, or whether you are an Italian teacher at any level, please come and join our conversation! Pre-U, an alternative to A Level? This is event for Secondary Schools colleagues in the North West, where colleagues can discuss the innovations and challenges of the new Italian specifications of the Pearson Edexcel curriculum for 2017. A practical session and roundtables will provide the opportunity to share ideas for your teaching and network with like-minded colleagues. The programme of the event is available to download. The presentations will be available shortly. Martedì 16 dicembre 2014, 10.30- 16.30 | Europa House, London. The event is an opportunity to celebrate the teaching of Italian in the UK to coincide with the Italian presidency of the EU council. The event aims to represent language teaching at HE level, but also at secondary and primary level. While looking at the history of Italian language teaching in this country, the sessions on the day also explore current issues and possible ways of meeting the future challenges of Italian language teaching in the UK. The wider aim is to involve as large a number as possible of UK HE institutions, schools and colleges, where Italian Studies are present or Italian language teaching is offered as a way of strengthening the position of the discipline. The School of Modern Languages hosted a one-day conference on Teaching and Learning Languages through online Open Educational Resources. This conference intended to provide examples of best practice from a broad educational spectrum – including Secondary Schools, Further, Higher & Continuing Education – to help bridging the gaps that exist in the teaching community, begin a more structured debate around this topic and create opportunities for sharing and collaboration. In 2010, the first ‘Enhancing the Italian Studies Curriculum: Innovation and Development Conference’ took place at the University of Manchester. The event was the first of its kind to focus on the teaching and learning of the Italian language, with contributions from a number of both HE and SE colleagues. It was jointly sponsored by the University of Manchester, Society for Italian Studies and Routes into Languages. The event welcomed around 50 delegates both from across the UK and Europe. 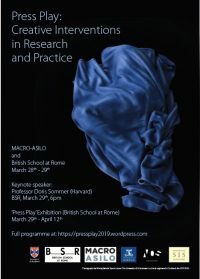 Fourteen papers were presented, including contributions from the two keynote speakers, Marina Orsini-Jones from Coventry University, and Dr Marina Mozzon-McPherson from the University of Hull. If you would like to know more on the event, please contact Elena Polisca.